Optomechanical probe positioners allow more comprehensive study of biological samples. This trending technology is playing a critical, unheralded role in life science research. 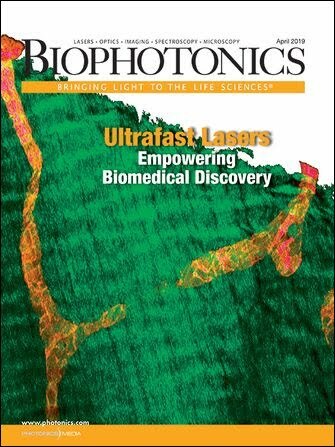 Photonics technologies enable life scientists to probe samples in the increasingly sophisticated study of processes ranging from neuron signaling to heart muscle contraction, as well as cells and cellular development. As research continues at increasingly finer levels of resolution, the requirements for optomechanical positioning become ever more demanding. Positioning equipment manipulates the probes used to interact with biological samples. This includes positioning a light probe, such as a focused laser or LED, and positioning a physical probe, such as an electrode or microsyringe. Many applications use a focused light beam — typically a laser or an LED — as the probe. The beam is frequently scanned using galvanometer mirrors or acousto-optic modulators. However, an increasing number of applications require careful placement of a stationary or intermittently moving light beam. This is often required for optogenetics studies conducted through a microscope. Such experiments need a way to accurately direct a secondary light source (laser) at one or more targets in the field of view. Along with optogenetics, several other types of microscopy experiments now require the ability to direct a spot of light at one or more locations in the field of view. Examples include photobleaching, uncaging, and selective gene ablation. To support all of these applications, a new generation of optomechanical modules now provides a cost-effective method for integrating an externally controllable secondary light source into conventional trinocular microscopes from leading manufacturers such as ZEISS, Nikon, and Olympus. The principle of operation is remarkably simple (Figure 1a). A 45° beamsplitter is placed in the infinity space of the microscope body (tube). Specifically, a dichroic, bandpass, or other beamsplitter is held in a compact slider assembly that mechanically dovetails between the microscope body and the trinocular head. 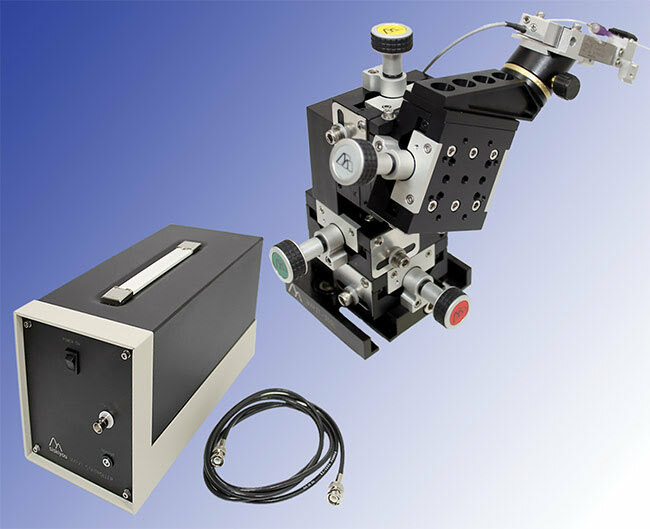 Once incorporated into the microscope, the slider mechanism allows the beamsplitter to be inserted and retracted from the microscope optical path — or even swapped for another beamsplitter — without any mechanical disruption or disassembly required. Figure 1. The IS-OGP, a modular subassembly from Siskiyou, collimates light from an input single-mode fiber and directs it anywhere in the field of view of an upright microscope via a 45° beamsplitter (a). The light can be focused to an adjustable-diameter spot, the position of which is precisely located or scanned via mechanical (differential screw) or automated actuators (b). Courtesy of Siskiyou. Collimated light is input to the assembly laterally from a single-mode, fiber-coupled collimator mounted in a precision, XY, double flexure mount (Figure 1b). The microscope objective focuses the resultant spot of light in the sample plane. The spot diameter depends on the wavelength of the light and the power of the objective; with a conventional 20× objective, light at 488 nm is typically focused to a limiting spot diameter of about 5 µm. Adjustment of the collimator in the mount allows the spot diameter to be varied from 5 to 50 µm with a 20× objective. Professors Minghong Ma and Wenqin Luo, of the University of Pennsylvania Mahoney Institute for Neurosciences, have used this microscope component in their research to investigate how different cell types are synaptically linked in the olfactory system and spinal cord, respectively. In a typical experiment, a 300- to 5500-µm-thick tissue slice is put in the recording chamber and kept vital using a standard oxygenated solution. Figure 2. Light-evoked responses in the olfactory bulb (OB) neurons receiving olfactory sensory neuron input. An OB slice showing the axons of olfactory sensory neurons coexpressing the odorant receptor M72 and ChR2 (a, left). Another slice under fluorescent illumination (a, top right) and differential interference contrast (a, bottom right) in which the OB neurons are visible. Whole-cell recording in voltage clamp configuration (Vhold = −70 mV) from an OB neuron (b). Laser stimulation causes large, inward post-synaptic currents indicating that light-sensitive olfactory sensory neurons form synapses with this cell. NL: nerve layer; GL: glomerular layer; DIC: differential interference contrast. Courtesy of Andrew H. Moberly and Minghong Ma, University of Pennsylvania Mahoney Institute for Neurosciences. Epifluorescence is used to find ChR2-expressing neuron axons. Differential interference contrast (DIC) imaging is then used to locate a suitable cell adjacent to the ChR2 axons. A patch-clamp electrode is subsequently engaged with this cell so that changes in membrane potential can be observed as a result of selective stimulation of the ChR2 axons, with a few milliwatts of 470-nm laser light introduced to the field of view using the IS-OGP module (Figure 2). Many applications require physical interaction with the sample and some type of probe, all under microscopic observation. For instance, the electrophysiological patch-clamp technique is widely employed, particularly in neuroscience and often in combination with optogenetics and/or functional imaging. Here, a microscopic pipette tip is used as an electrode to apply a voltage (potential) change to a cell membrane to clamp the membrane potential or measure changes induced in it. The sample may be cells in vitro or live neurons, or muscle cells in model animals (usually mice). By using a very small micropipette aperture, a patch or membrane can be sampled containing anywhere from just a single ion channel protein (typical pipette diameter <0.3 µm) up to hundreds of ion channels. Researchers thus need a way to position this pipette with submicron precision. Moreover, most of these experiments are performed under an optical microscope, often with less than 2 mm of working distance under the objective. As a result, the probe has to be brought into the sample within a very limited angular range. Enabling simple probe and pipette placement and replacement under these tight constraints is not trivial. Typically, multiaxis assemblies are used, where most of the axes are equipped with both coarse and fine adjustment. At a minimum, these include XYZ adjustment and rotary action to swing the assembly in and out of the sample field. Most importantly, these include a dedicated fourth linear axis aligned with the electrode tip. Such linear motions most commonly use crossed-roller-bearing translation stages because they deliver precise linear motion (eliminating pitch and yaw) with extremely long lifetime. In the simplest setups, all of the motion is manually controlled using coarse- and fine-drive screws. But in increasingly sophisticated experiments, and to increase data throughput, some or all of the axes are motorized for automated operation. Here, the user has the option of choosing actuators based on DC motors, stepper motors, hydraulics, or piezo components. The electrical signals are incredibly small, which is why the pipette electrode is directly mounted to a preamplifier head stage — low signals mean low noise is critical. For this reason, DC motors are often the first choice in patch-clamp studies because they draw no holding current when stationary. This minimizes electrical noise around the sample. Hydraulic actuators are also quite popular for patch clamp assemblies. The responsiveness of hydraulic systems means they are particularly well-suited for demanding research applications with typical cell diameters around 10 µm or less. They often represent the best solution for intracellular recording, where an abrupt impaling action is needed to pierce the cell with a sharp electrode. And generally, these types of experiments run less than 20 min in duration, so minor long-term drift common with hydraulics is not an issue. The ability to make rapid piercing movements is the reason hydraulics are often preferred for microinjection-type applications. For example, they are widely used in clinical applications for tasks associated with in vitro fertilization (IVF) laboratories, to perform genetic material transfer as well as fertilization. In patch-clamp studies, a key trend is increased speed. Typical cellular response curves measure under 200 µs. To obtain useful real-time data, researchers need to initiate and terminate stimuli and monitoring functions on a similar time-scale. An invaluable tool is the theta (θ) micropipette, in which a septum running along the length of the tip enables the application of two different solutions and two independent electrical contacts. Fast switching between the two sides of the pipette requires fast lateral motion, at 90° to the pipette axis, without any tuning-fork ringing. Neither DC motors nor hydraulics can accurately and easily provide this high-speed motion. Conversely, piezo actuators are capable of the requisite switching speed but have a total range of travel of 250 µm or less, and so are not suitable for overall positioning of the pipette. Figure 3. Fast dynamic electrophysiology measurements are enabled by hybrid multiaxis systems that integrate mechanical and piezo motion actuators. Courtesy of Siskiyou. To solve this challenge, optomechanical manufacturers have developed multiaxis systems with hybrid technology. An example is the MXPZT-300 series from Siskiyou (Figure 3), which features four linear axes (X,Y,Z, and the probe axis), each with 20 mm of motion provided by ultrastable, crossed-roller-bearing micromanipulators driven by fine-pitch manual screws. These allow precise positioning of the theta probe. A piezo flexure is incorporated in the probe axis, providing fast motion lateral to that axis. This enables fast switching — up to 50 µm/msec — between the two sides of the probe tip. This type of system is also available in two mirror-image forms to provide access from the right or left side of the microscope experiment. This simplifies integration in complex setups and enables two probes to be separately used in the same experiment, one from each side. In addition, fast back-and-forth motion of the pipette tip has a strong potential to cause ringing vibrations, so these systems incorporate resonance-suppression algorithms in a smart control board that provides the drive voltage to the piezo flexure. While these are factory optimized and set, users have the option to “tune” active damping to match problematic vibrations in a specific setup. In many instances, positioning involves a probe that is buried within a more specialized instrument or tool. An example is the MyoStretcher series from IonOptix. It is used to investigate the contractive response of myocyte (muscle) cells as pulling forces or other stimuli are applied (Figure 4). This microscope-based instrument platform allows a range of different multimodal experiments to investigate both auxotonic and isometric forces. Auxotonic contractions involve myocyte shortening, whereas isometric forces are generated without any physical shortening. Figure 4. The inner workings of a MyoStretcher feature two tipped rods that can apply and/or sense minute forces associated with a single myocyte. The rods are positioned using DC servo units; Siskiyou MX7000 series. Courtesy of IonOptix. In use, each of two XYZ micro-manipulators holds a glass rod with the typical dimensions of 25 µm diameter × 500 µm long. The rods are first dipped into a droplet containing MyoTak and then used to pick up a myocyte from a glass surface under buffer. When a myocyte is triggered to contract, by force or electrical stimulation, it causes changes in the sarcomere spacing within the cell — the length of the classic repetitive dark and light striations that defines striated muscle fibers. This periodic spacing is typically around 1.8 µm and is measured in this instrument by fast Fourier transform analysis of a red-light-illuminated, bright-field image acquired by a high-speed (250 Hz to 2 kHz) CMOS camera. Unique to this approach, nanoscale forces generated by a single myocyte can be measured by means of an optical approach that IonOptix calls OptiForce, where the motion of the rod tip is sensed interferometrically by means of bouncing a near-IR laser off a tiny mirror on the rod tip. It is critically important that the micromanipulators do not exhibit play or drift. For example, the MyoStretcher incorporates DC servo units (the Siskiyou MX7000 series, among them) as micromanipulators. Such technology demonstrates the lowest amount of play and drift in tests, while providing up to 20 mm of motion in each axis. 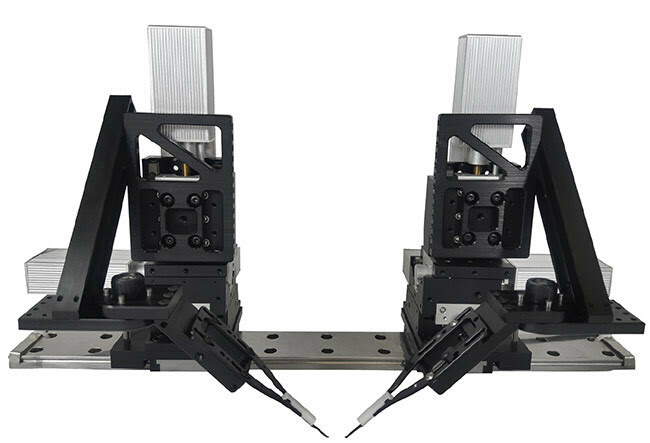 In particular, three-axis modular units feature a motorized actuator with antibacklash gearhead (in each axis), driving a crossed-roller-bearing, highly linear stage; this eliminates any axial or lateral play. This technology and others that enable optomechanical positioning are playing a critical role in life science research. John Wingerd is a senior mechanical engineer at Siskiyou Corp. in Grants Pass, Ore.; email: johnw@siskiyou.com.